It gives me great pleasure to inform you - especially those of you who are lovers of Polo and horses - the state government of Manipur has agreed to establish a natural preserve for the homeless Manipuri Pony. Last month, the Chief Minister of Manipur gave 200 acres at Heingang Lake just below the Pony Shrine for this. Heingang Lake is wet only during the monsoon but the animals like boggy wetlands and feed on water plants as well. The lake is covered with lotuses in the summer. Not only that, the state has agreed to declare the Manipuri Pony a protected animal. We have reason for some optimism now that the Manipuri Pony, descendant of the great animals of the Mongols, and one of 5 equine breeds in India, will pull through and their number will rise from the perilous less-than-1000 that it has dwindled to today. We have also now established a Manipuri Pony Society so if you are on Facebook, do join. I am thinking I will get some Manipuri T-shirts made! This short video shows two Sorraia horses in a carriage driving event in Portugal. The Sorraia is an ancient breed thought to have been influential in the development of the Lusitano horse. The Portuguese breed association page is here. You can find English information here. The Konik horse has an interesting history. It is the result of breeding programs which were attempting to resurrect the extinct Tarpan horse, one of the original wild horses of Europe. The last Tarpans died in captivity in the late 1800s, but interested parties noticed some horses in rural areas of Poland which resembled the Tarpan, though they were probably mixed with domestic bred horses. These were gathered for a breeding program to try to recreate the Tarpan, with one result being the Konik (which means "little horse" in Polish). According to this article, the Nazis, fascinated with nature, ancient history and genetics confiscated some of the herds during WWII, taking them back to Germany. These herds did not survive the war, but enough Koniks remained in Poland to resurrect the program after the war ended, and today there are Konik herds in various parts of Europe. There are more beautiful photos of Koniks on Astrid van Wesenbeeck's photostream on flickr, which is the source of the photo above.The horses in her photos live in a nature reserve in the Netherlands. The Konik program was not the only attempt to recreate the Tarpan. The Heck horse was developed from a breeding program at the Munich zoo, using Konik, Icelandic, Gotland and Przewalski horses. There have been further attempts even in the United States. 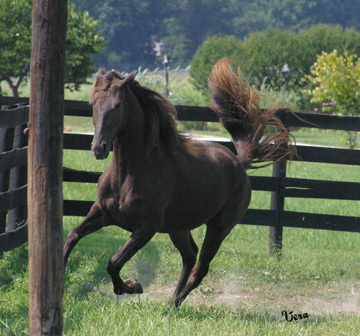 The North American Tarpan Association supports breeding and registering of Heck horses, although it may not be active anymore, as the last blog posts are from 2006. Another breeding program in the US is run by the Stroebels family in Oregon, about which more in this news article. This Canadian website, Argamak Stud, has a page featuring some spectacular photos of Akhal Teke horses. They are such a unique and exotic breed! Their website (a bloggy sort of website) has lots of articles, photos and information about this rare breed. Worth a visit! Jessica Drake at The Painting Pony has some beautiful calendars for sale, based on her lovely professional photographs. My favorite is the Endangered Horse Breeds calendar, which features super photos of breeds like the Cleveland Bay, Exmoor, Akhal Teke, and many others. Jessica also has calendars featuring just Akhal Teke horses, and many other horse-related products. I just watched Tapadero, a 2005 movie about the vaquero tradition in California. It is a very interesting video if you are interested in cowboy culture, old California and the vaquero tradition. It covers the history of the vaqueros from their origins in old Mexico through the Spanish settlement of southern California to the modern day. Detailed attention is given to the style of saddles, the making of riatas (lariats), the use of the bosal and spade bit, the methods of roping, and other details of vaquero life. Influential trainers such as Bill Dorrance are also featured. This might be too much detail for someone with only a general interest in horses, but is very engaging for those with a special interest in the old Western traditions. The video is nicely produced and packaged, and features a variety of vaquero-themed music in the soundtrack. It also features some amazing scenery from the old California ranches where the vaquero tradition developed and survives. The Oldest Breed in the World? Studies into the Retuertas have been ongoing since the 1980s. The DNA of this endangered species of horse has been closely examined along with that of another ten breeds from Europe and North Africa, and was found to have nothing whatsoever in common with any of them. Neither the English thoroughbred nor the Pura Raza Española; neither Arabs nor British mountain and moorland ponies, and were found to be no relation whatsoever to native Spanish breeds such as the Losino, Mallorquín, Menorquín, Asturcón, the Spanish Trotter nor the Basque ‘pottoka’ breed. There are some more photos at this link. Update: here is the original scientific study that led to the news cited above.